​Carpal tunnel syndrome is caused by an inflammation of the muscles and/or tendons of the wrist. 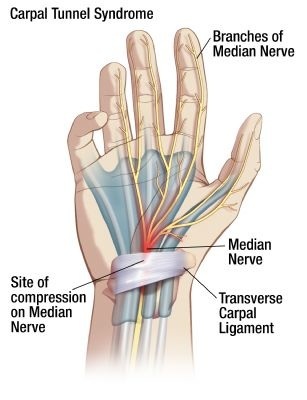 This inflammation reduces the space in the carpel tunnel, which can impinge the median nerve. This impingement results in numbness, tingling, and reduced range of motion. Decreased functional ability of the wrist and fingers may result as well.